Paper reports for all grade levels will be available after the winter break, at that time, you can email diana.clawson@austinisd.org to access. 9th grade students and parents will receive an email from AISD on Dec. 18th that explains how to access and interpret 9th grade PSAT scores. Great news! Austin High School has worked diligently with the City of Austin to resolve lack of student parking. The City of Austin has agreed to allow students with a valid school-issued parking permit to park in the MoPac Lot. Students who do not already have a school-issued parking permit may register online starting this afternoon. Please complete the parking permit request form, pay the permit fee through School Cash Online, and then pick up a permit in the main office (see Linda Garcia on 2nd floor) before school, during FIT, or during lunch. We appreciate your patience as we worked to resolve this issue. The Maroon Society honors outstanding Maroons who have contributed to the Austin High community with their service, commitment, and example of what it means to be Loyal Forever. Maroon Society honorees will be announced at the Dedication Day Grand Assembly in April, and each Maroon Society honoree will receive a small scholarship for college expenses. All seniors are eligible to apply. Parents, guardians, and teachers can nominate students in grades K-12 for the GT Assessment Process. Please click on this link and email it to isabelle.salazar@austinisd.orgor drop the form off in the front office. Class of 2019 Seniors celebrate the first day of school. 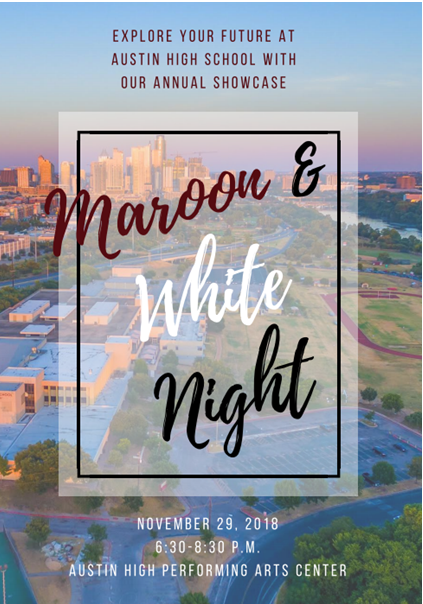 Explore Austin High’s extensive academic and extracurricular programs and learn all about the academy model at Maroon and White Night on November 29. The evening will kick off at 6:30 p.m. in the Austin High Performing Arts Center with a special presentation highlighting the many opportunities future Maroons will have when they join our Austin High community. Tour the building to see special programs like Project Lead the Way STEM pathways, Culinary Arts, Fine Arts, Student Media, Athletics, and many more. Visit our academies and ask questions about signature experiences in The Academy for Classical Studies, The Academy for Design & Technology, The Academy for Global Studies, and The Academy for Science & Innovation. Come see your future at Austin High School! Austin High has a long tradition of excellence. Our Hall of Honor recognizes the accomplishments of our distinguished alumni and the contributions of honored faculty each spring at our Dedication Day ceremony and celebration. Students who would like to help organize and host this special event are encouraged to join the Hall of Honor Student Steering Committee. Any student can join the general membership to help with Dedication Day. Students who are interesting in taking on leadership roles are encouraged to apply now for the Leaders' Council. Applications for Leaders' Council are due on Thursday, October 11. See the Steering Committee website for more details. The first general meeting of the Hall of Honor Student Steering Committee will be held Friday, October 19, during FIT (10:30-11:00am) in the Library. 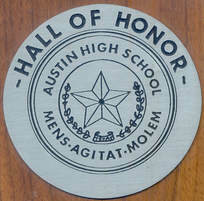 ​Come discover and celebrate the history of Austin High! Consider Austin High as your School of Choice. Explore your future this fall! Click here to Learn more about our academies. Attend a principal coffee: November 15, 2018 9:30 – 10:30 a.m. in Cafe Austin to learn more about the new academies at Austin High. Click here to see ﻿all the Principal Coffee dates﻿.